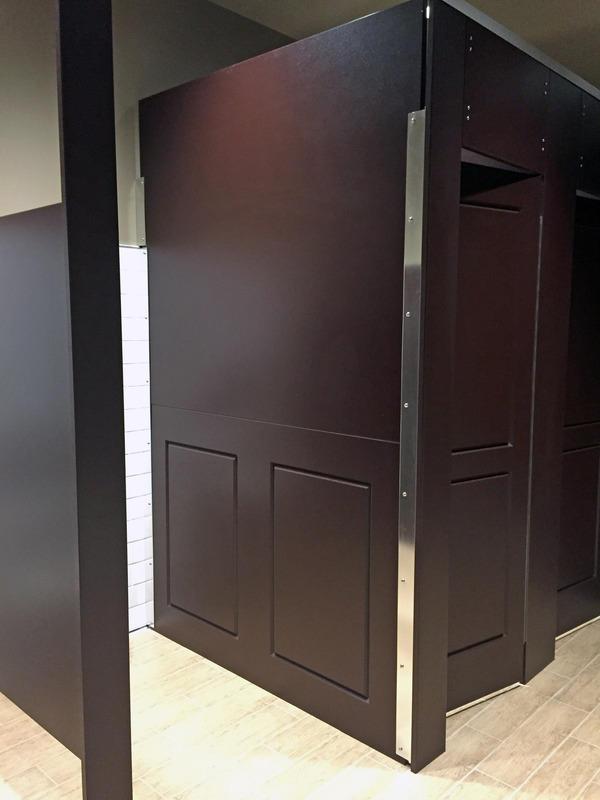 Scranton Products' new Aria Partitions add luxury and style to the restrooms at the newly opened headquarters of The Sacramento Regional Builders’ Exchange (SRBX). The partitions were donated to the non-profit, which serves Northern California’s commercial construction industry. 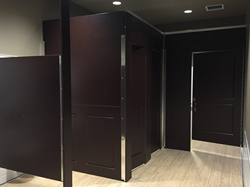 SRBX added luxury to its restrooms with Aria Partitions donated by Scranton Products. The Sacramento Regional Builders’ Exchange (SRBX), a non-profit serving Northern California’s commercial construction industry, has opened a new ultra-modern, 11,000 sq. ft. headquarters in Sacramento with the donation of Aria Partitions™ from Scranton Products. Opened in late 2017, SRBX’s new offices boasts a distinctive color scheme of rich blues, burgundies, and wood tones mixed with polished concrete floors, glass walls, and murals capturing Sacramento’s history and scenic skyline. The motif was then extended into the organization’s restrooms with a design made to resemble many of the area’s country clubs. This includes a mix of white, silvery tiles, floor panels resembling wood planks, and Aria Partitions™ in a mahogany tone. Aria Partitions were developed by Scranton Products to add enhanced comfort and privacy as well as elegance, warmth, and charm to virtually any enclosed or private room. In addition to removing sightlines to ensure privacy, they are also available with 17 innovative door designs, 7 panel designs, and 27 rich colors and textures. To learn more about Scranton Products’ new Aria Partitions please visit http://www.scrantonproducts.com or call 800-445-5148. SRBX chose Aria Partitions in Mahogany color to complement their rich color motif.